The recent Nature Feature Reproducibility crisis: Blame it on the antibodies strongly underlines the urgent need for antibody validation and cross-reactivity testing. To address this topic, PEPperPRINT has developed a new three-step approach for the cross-reactivity analysis of antibodies based on the new PEPperCHIP® Human Epitome Microarray. The PEPperCHIP® Human Epitome Microarray with 29,127 different peptides covers all linear B-cell epitopes of the Immune Epitope Database with the host “human”. The microarray is, hence, an ideal tool to screen for antibody responses against tens of thousands of different antigenic peptides that were described in literature and linked with antibody responses in human serum or plasma. 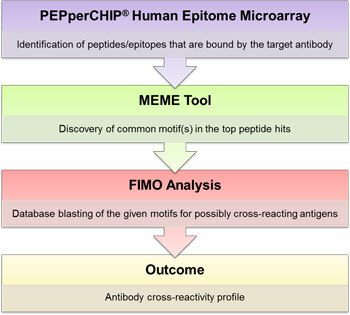 The three-step approach is further complemented by bioinformatics analysis of the top cross-reactions of an antibody using the MEME and FIMO tools of the MEME Suite for motif discovery and correlation with protein databases. This application note describes the cross-reactivity analysis of a human monoclonal anti-c-Myc (chi9E10) antibody with the aforementioned three-step approach. The human monoclonal antibody reacted with a number of peptides of the PEPperCHIP® Human Epitome Microarray with moderate to high signal-to-noise ratios. MEME analysis of the top peptide hits revealed a common motif xLV(S/A/P)E that was further analyzed with the FIMO tool to identify cross-reactive human antigens containing the same motif.